Last week we hosted the final program in our Non-Fiction series with an audience of 237 guests. 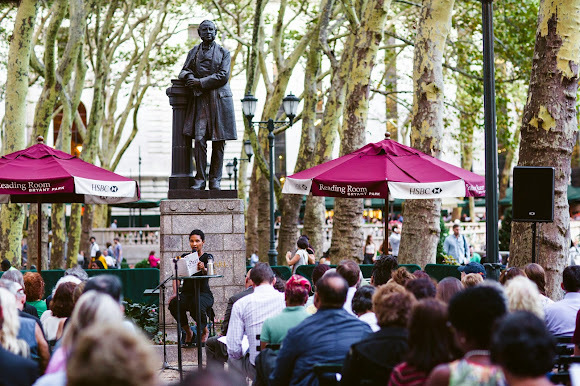 Danielle Allen, author of Our Declaration: A Reading of the Declaration of Independence in Defense of Equality, engaged the audience with her discussion on the role of equality in the declaration. John Hope Bryant, Entrepreneur and Founder of Operation HOPE, discusses his book How the Poor Can Save Capitalism: Rebuilding the Path to the Middle Class. The Solution for the 100%. John is known as one of the foremost authorities on poverty eradication, and has been an adviser to the last four sitting U.S. Presidents, a thought leader, motivational speaker, and an innovator in the business of empowerment. Hosted by Dan Hanson, Sustainability Investments Expert, Partner and Head of U.S. Equities at Jarislowsky Fraser USA. Peter Gizzi, Dorothea Lasky, Amber Atiya, and Cathy Park Hong read original works. Produced in partnership with Tim Donnelly.